I am a Innovative and mechanical designer ,and I invented several devices in different fields such as (gills for humans to breathe under water without oxygen cylinder), photographer (specialized in photography of flowers and landscapes) , strong work ethic, team-player, organized ,experience in presentation ,experience in manual mechanical drawing and medium experience in AutoCAD, Photoshop and 3D printer. – Founding member of Jordan Inventors Association. – Trainer within the program of the great engineer to teach creativity and innovation skills in the field of electronics and robotics and engineering sciences for school students. – Member and volunteer in Forum of the sons of Balqa Cultural. – Supervisor of the laboratory of invention and innovation in Forum of the sons of Balqa Cultural at 2012. – Member and volunteer in Jordan Youth Association. – Member and volunteer in Initiative Ta’lelah. – Winner in 1st place in the international competition Falling Walls Lab Jordan competition as the best invention for 2017 from out of 70 competitors from Jordan on 10/10/2017. 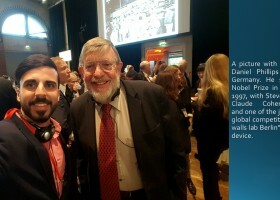 – Representative Jordan in BerlinGerman in the Falling Walls Berlin competition and in the International Conference on Future Breakthroughs in Science and Society from among 100 people around the world on 8 and 9/11/2017. – Winner in 2nd second place in the global competition Hult Prize 2017 in Balqa Applied University from out of 20 team competitors ( 54 people ) as the best invention and qualification to the finals in Tunisia on 21/11/2017. – Representative Jordan and Balqa Applied University in the finalists competition of Hult Prize Tunisian and one of the “Top 6” in the finalists as the best invention in 2018 from out of 55 teams (250 people) from 35 countries around the world on 17/3/2018. – Representative Balqa Applied University in the finalists competition of Hult Prize Jordan, and one of the “Top 7” from out of 39 teams (150 people) from Universities of Jordan in the finalists as the best invention for 2018 on 5/5/2018. – Winner in 3rd place in the Phi’s Applied Research and Innovation 2018 competition in Jordan as the best innovation and project for 2018 on 17/8/2018. – One of the participants in the competition of Intel Science and Technology 2012 in Jordan with invention of (water life) gills of the human being used for breathing without a cylinder oxygen, similar to the work of gills in fish. – Registered a patent request for a device to generate electricity from water flow inside the pipes after research and drafting by the Royal Scientific Society in Jordan, Intellectual Property Office on 13/6/2017 and 25/1/2018. – A scientific researcher in the field of renewable energy and also in the field of solutions to environmental problems, and worked in a team in the university graduation project for Extraction Microcrystalline Cellulose (MCC) From Wheat Straw to reduce agricultural waste and the production of natural polymer (cellulose), which is used in many fields.